As a primer to thinking about the new farm bill, we take a look at the relationship between net farm income and direct government payments. The process of writing the new farm bill is well underway. To say the economic environment facing agriculture today is different than at the time of writing the last farm bill would be an understatement. The last farm bill was passed when farm incomes were near record highs, whereas today net farm income is forecast at a multi-decade low. As a primer to thinking about the new farm bill, we take a look at the relationship between net farm income and direct government program payments. Government support of agriculture has a long history in the United States. Over the years, the government has provided income support to farmers through a variety of different mechanisms, ranging from price supports to fixed direct payments. The real value of direct government program payments is shown over time in Figure 1. The figure shows two periods of relatively high direct government program payments. The first occurred in the mid-1980’s and the second in the late 1990’s and early 2000’s. Since 2006 direct payments have been on a steady decline, with 2018 direct payments forecast to be the lowest amount seen since 1982. In nominal dollars, the 2018 payments are the lowest seen since 1997. Figure 1. 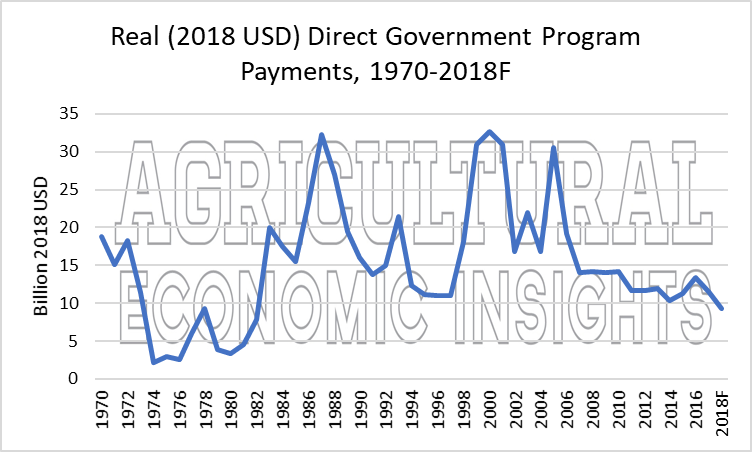 Real (2018 USD) Direct Government Program Payments, 1970-2018f. One might note the two periods of high government program payments correspond to relatively challenging times in the farm economy. The mid-1980s were a well-documented period of severe financial stress and the late 1990’s to early 2000’s were also financially challenging, although not anywhere near as financially stressful as the mid-1980’s. What is interesting about this data is that the recent downturn has not been met by an increase in direct government program payments. From 2013 to 2018 the USDA’s Economic Research Service estimates that real net farm income will have fallen by 53%, yet in real dollars, direct farm program payments will have fallen by 22%. A scatter plot of the annual percentage changes in real net farm income and direct government program payments is shown in figure 2. The overall correlation between direct government program payments is -0.10 meaning that there is a slight tendency for payments to move in the opposite direction of net farm income. However, this relatively weak correlation is not easily observable from the chart. We have also marked two periods in the data with different colors. The data from 1982-1986 are shown with green dots while the data from 2014-2018f are shown in red. The rest of the data are in blue. The difference in the relationship during these two periods is noticeable. During the 1980’s there was a much clearer negative relationship between changes in net farm income and government program payments (payments tended to increase when incomes fell and vice versa) than in the most recent period. Over the whole span of the data, direct government program payments are only modestly counter-cyclical, with a slight tendency to rise when incomes fall and vice versa. In other words, if the goal is to construct a program that is intended to provide a safety net in times of falling income, the programs have been only modestly successful at best. Based on the structure of the widely subscribed ARC-CO program, payments tend to decline in the face of multi-year declines in farm incomes. When the bill was written it is likely that many expected such declines to be only temporary in nature, maybe a year or two, in which case the ARC-CO program payments would decline much more modestly. As a new farm bill comes to life it will be important to consider how payments relate to changes in net farm income. Based on most news reports it appears that the new farm bill will look a lot like the old one. If this is the case one might expect widespread enrollment shifts toward the PLC program if such changes are allowed.